From dirndls and lederhosen to singing nuns and Nazis, this film has got the lot. 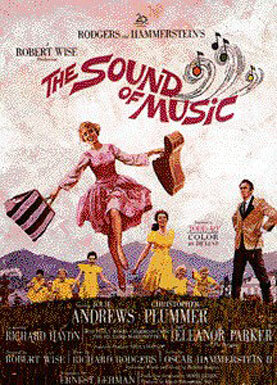 Shot in DeLuxe colour in the Austrian Alps around Salzburg and intercut with scenes filmed at Fox’s Hollywood studios in Los Angeles, The Sound of Music is a landmark musical, a veritable pinnacle of achievement within the genre. All those peppy Oscar and Hammerstein songs, like ‘Some of My Favourite Things’ and ‘I Am Sixteen Going on Seventeen’ trigger a gush of warm and fuzzy feelings, while the show-stopper ‘Climb Every Mountain’ leaves you breathless and inspired at the end. Over the years, these catchy tunes have become imprinted on our very souls and have more recently spawned a world wide phenomenon of sing along screenings. After all, this is a family film and, as the legendary Julie Andrews says in her DVD introduction, its enormous popularity is probably due in part to the decent family values portrayed within. Andrews famously stars as Maria, the irrepressible novice about whom the other nuns have grave concerns; ‘underneath her wimple she has curlers in her hair!’, they trill. The best cure for her free spirit, the Reverend Mother (Peggy Wood) decides, is to release her from the abbey and ship her off to work as a governess for the recently widowed Captain von Trapp (a dishy though apparently frequently tipsy Christopher Plummer). So off she trots, guitar in hand, to tame the unruly von Trapp tribe and win their hearts with her inherent goodness. Forty years after its wide-screen release, this classic has been packaged up in a special two disc set with all sorts of extra goodies like a filmed reunion of the seven actors who featured as the von Trapp children (one of them, Nicholas Hammond, who played the “impossible” Freidrick now lives in Australia and is the partner of Robin Nevin, the Artistic Director of The Sydney Theatre Company). There’s also a documentary on the real von Trapp family and a commentary by the tenth child, Johannes, the son of the Captain and Maria, who recalls how his father really did blow a whistle to summon his offspring into line. This is an eternally uplifting tale about the very life force itself and after watching it, you’ll find yourself humming those old show tunes all over again.